Hana is a 19-year-old student who falls in a “fairy-tale like” love with a “wolf man”. Over the course of the 13-year story Hana gives birth to two children – older sister Yuki, and younger brother Ame, or “Snow and Rain”. At first the family quietly lives in the city trying to hide their wolf heritage, but when the “wolf man” suddenly dies Hana makes the decision to move to a rural town, far from their previous city life. Normally this isn’t my type of film and I wouldn’t have watched it. The struggle of a single mother raising two children on her own, that’s a good story on its own but here’s the twist that got me. They’re Werewolves. You get a life time of emotion from this film, ups and downs but in the end it’ll make you feel really just happy. Hana’s struggle is so alien but at the same time it’s somehow relatable, well done writers for that. 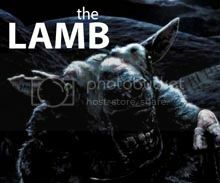 But that’s just one development; you also get to see a coming of age of two children of a bizarre upbringing, do they embrace humanity or become the wolf. 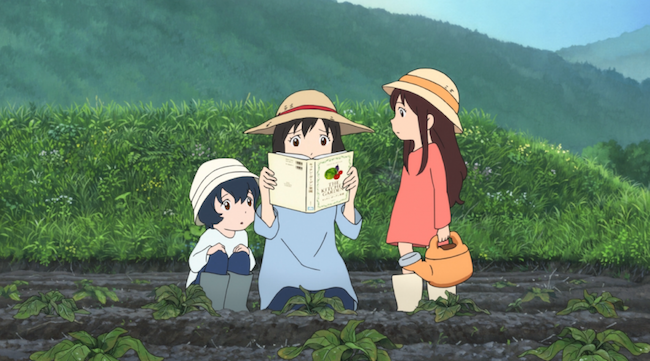 My favourite scene would have to be either the old man helping Hana grow the crops after seeing her struggle so hard after failing time and time again. Or when Ame and Yuki fight in the kitchen, because it’s a real turning point between the two of them. Choosing their paths. And I loved Yuki’s narration. This a real short one about 46 minutes so it won’t be a big loss if you don’t take to it. This is a really weird love story, in many aspects. Right from the offset they don’t get together and nor should they based on their ages, that aside they do get close and it’s a really sad but fascinating relationship to watch. 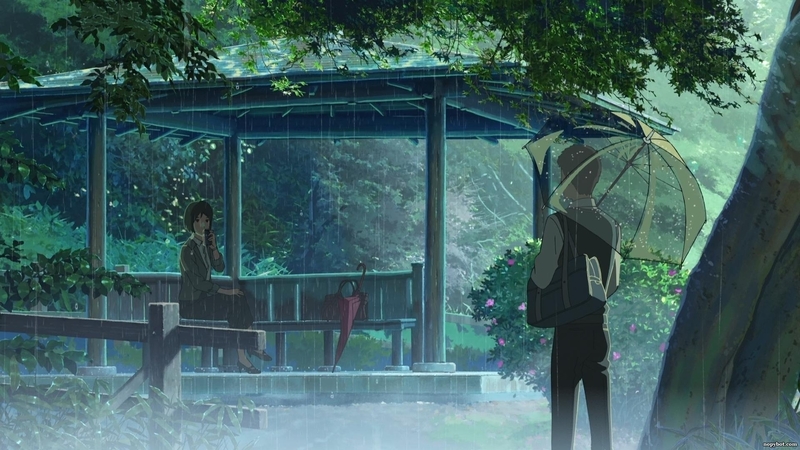 According to the director (Makoto Shinkai) in Japanese “love” was written as “lonely sadness” and this was his basis for the films relationship, which is definitely what you get. I couldn’t quite figure out why it was only 46 minutes long until the first few scenes played out in the rain, boy those visuals must have cost a fortune to make, that and a lot of time. Worth it though, the visuals are just stunning, some scenes look like real photographs. My favourite scene would have to be when Takao sees Yukari as a teacher at the school; my brain froze for a moment because it really came at me from nowhere. I even had a theory she was a ghost or something. 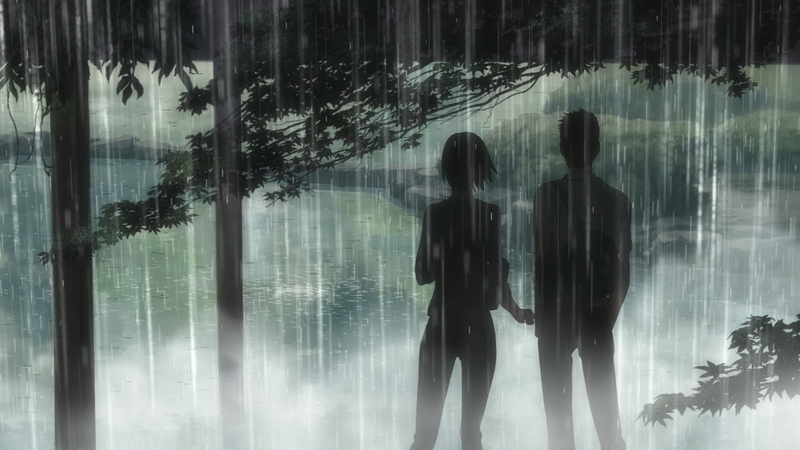 Embarrassment aside it was fascinating because clearly they had never met at school because they both skipped the same rainy days. Funny but sad scene, wow should have seen that coming. Looks really interesting, Tim! I’m not big into anime, but my best friend is ALL about it, and I’m certain she’s probably seen both of these. The Garden of Words looked beautiful! I have seen both of these films on sale at Fry’s a lot, but never bought them because of their run-times didn’t justify a full length purchase price. Also, I knew nothing about them. So thanks for the good reviews! I’ll have to track them down by other means. Well I certainly hope you check them out, they are really good films. Always give’em a try Nick. ANIME! Wow, these animation are gorgeous! Nice mini reviews Tim, hope you’ll do more of these. I should do mini-reviews since I have about 20+ films I need to finish writing about! 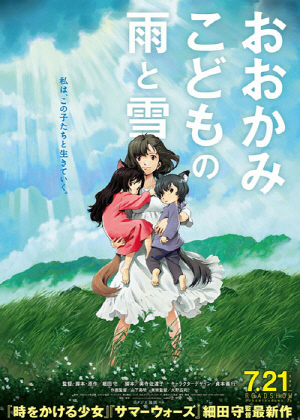 The Wolf Children is a magical film that shows the love between parents and children in a new and unique way. What makes it special is that it doesn’t sugar-coat anything (the story gets really dark) and yet it is visually beautiful and the soundtrack is exceptional. Seeing Hana’s love for her children and the depiction of their struggles was made believable and all the more rewarding by the way the writer and director integrated everything into the real world. Yeah I remember your review. Had to give a go. Glad I did. Thanks for the comment man. What was your favourite scene of the film? My favourite scene was the one where Ame and Yuki experienced seeing the snow fall and the entire family dashed into the forest! 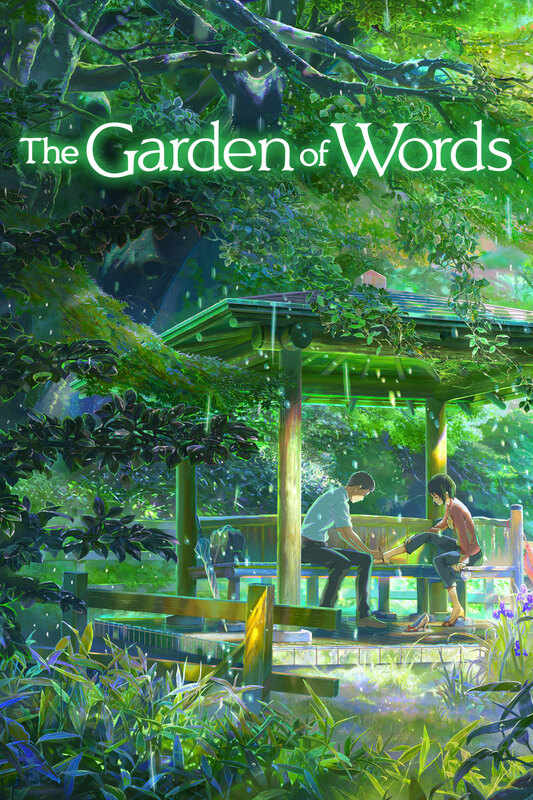 Could not agree with you more on the 100% score for the visuals on The Garden of Words. That is genuinely one of the most beautiful looking films I’ve ever seen. Glad to see you rated Wolf Children so highly as well. I have a copy of that here that I keep meaning to watch. A personal preference obviously, but I cannot watch dubs. All about the subtitles for me. Enjoyed the new feature mate. Looking forward to more. Oh great, glad you agree. Yeah the visuals where stunning. I understand the Sub/Dub. I tend to pick which ever I see first. At least in the past 10 years the dubs have really improved. They used to be pretty awful! I think my aversion to dubs is based on something I saw ages ago and no doubt they have improved. But it is just one of those things that is so ingrained now, I will probably never change. I think those wolves look kind of cute lol, plus I have soft spot of wolves 🙂 I like these mini reviews on indie/drama films and finding out new stuff that I might be interested in. Also glad you liked the mini review format. Am sure i’ll do more. Always great to be introduced to new movies. Thanks Tim! Which one are you most interested in?